EDM Services recently completed the sixth installation of their patented TripWire® System. This system reduces the likelihood and consequences of incidents caused by third party damage, theft, and terrorist activity. The sixth system was installed for PEMEX, Mexico’s state owned oil company on their Burgos – Penitas project in Reynosa Tamaulipas Mexico. The TripWire® system provides third party and terrorism protection for a crude oil pipeline, approximately 21 kilometers in length. There has never been a third party or other caused release from any pipeline protected by our patented TripWire® system. Some customers have used multiple fibers to increase the protection offered by their TripWire® system. For example, in one case in New York, the applicant installed two fibers, one on each side of the ditch, about one-foot above the pipe. Another customer in Louisiana installed a total of four fibers – two beneath the pipe and two above the pipe, at the edge of the pipe ditch. The additional fibers increase the likelihood of the fiber being damaged, resulting in an alarm. These additional fibers are very inexpensive to install and the cable is inexpensive. The basic Trip Wire® system includes the following standard components, which are tailored to each application. System Controller – This unit includes a NEMA 4 (weatherproof) enclosure, with a programmable logic controller (PLC) (or interface to the customer’s PLC), interface programming, and the other equipment necessary for a fiber optic TripWire® system. Each control unit can continuously monitor a length of about 350 miles. However, we generally limit control unit spacing to a maximum of 50 miles; this ensures adequate headroom for future splices and other line losses for the life of the pipeline system. Fiber Optic Cable – For most installations, we recommend fiber optic cable systems, instead of a metallic cable system. The fiber optic system provides an alarm when the cable is severed or damaged. In areas where direct burial cable is desired, where it may be subject to rodent damage, armored cable is normally used. Installation/Commissioning Support – We typically spend two to three days on-site after the system has been installed by the customer’s construction contractor. During this time, we test the installed cable, complete all fiber optic terminations at the system controller, adjust the field equipment sensitivities to match the field installation, test/modify the PLC and SCADA system interface drivers, and train the Company’s personnel to make field cable splices. The control unit is normally co-located with an existing Company pipeline PLC (e.g. at an existing remotely operated block valve or pump/compressor station). We normally include all drivers and PLC interfaces with the control unit. 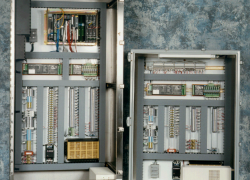 The control unit can be housed within an existing PLC enclosure or in a separate enclosure, which is included. The customer simply needs to modify their control room human machine interface (HMI) to show the new alarm and the alarm location. Please contact our office to discuss your immediate project needs.